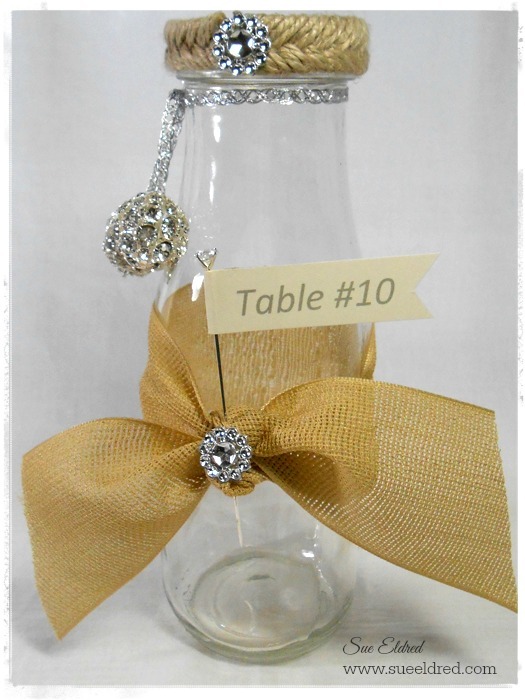 Make your own table markers for your wedding day or another special event. Measure the distance around the top of your jar. Cut and remove the wire from the Natural Jute Cord. Apply a little bit of glue on each end of the Jute Cord to prevent fraying. Glue cord around top of the jar. Glue on gem to cover seam. Thread two Blingella Beads onto a length of Quasar ribbon. 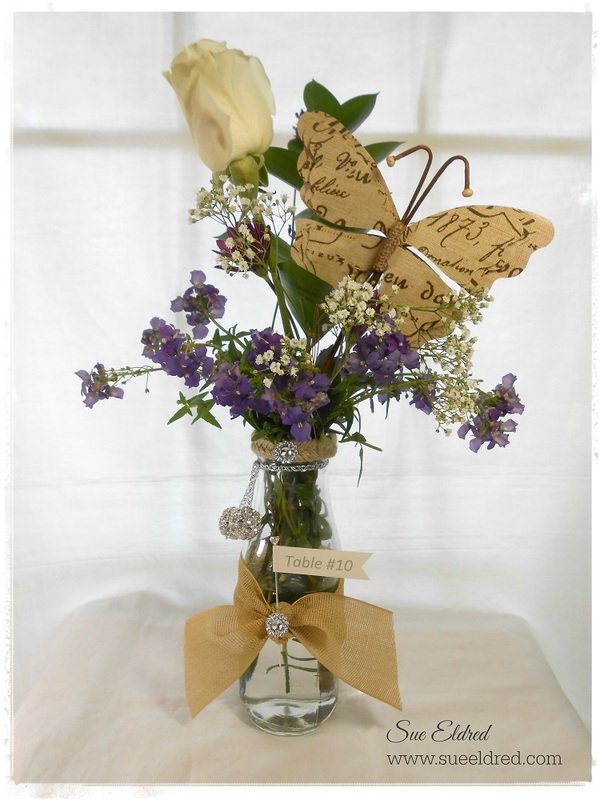 Tie ribbon around neck of the jar with a knot. Trim and knot ends of Quasar ribbon to hold the beads in place. A little bit of glue on the ends of each knot will add extra security. Tie Gazette Ribbon around the center of the vase with a knot. Add a small amount of glue underneath the knot to hold the ribbon in place. Glue small gem onto knot. Print a computer generated table number or greeting onto cream card-stock. Trim and cut card stock. Cut the end with a “v” to create the banner. Leave enough card-stock on the left side of the banner so that it can be folded around the Deco Ice stick pin. Attach banner around the Deco Ice stick pin and insert into the Gazette Ribbon knot. 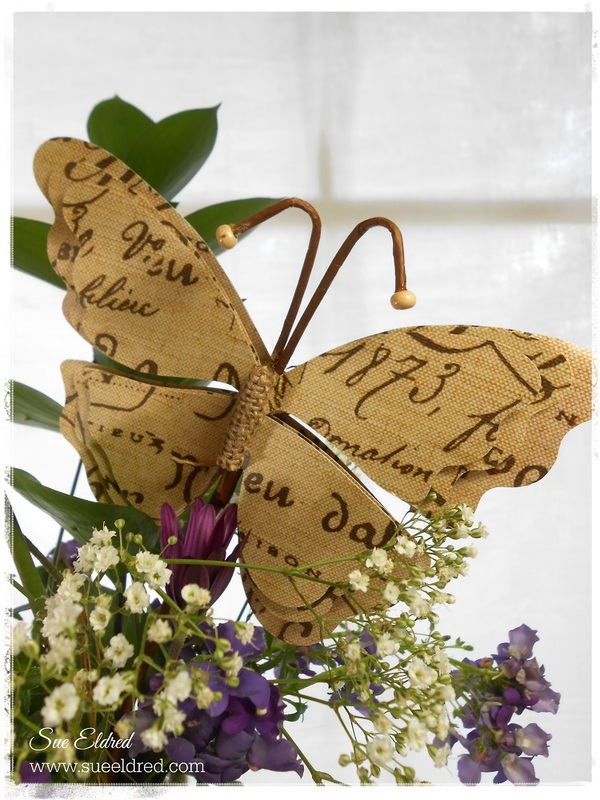 Fill vase with flowers and add the Fabrique Butterfly.